Experience the full creative power and processing flexibility of IK's ultimate sound and groove workstation with SampleTank 3 SE. 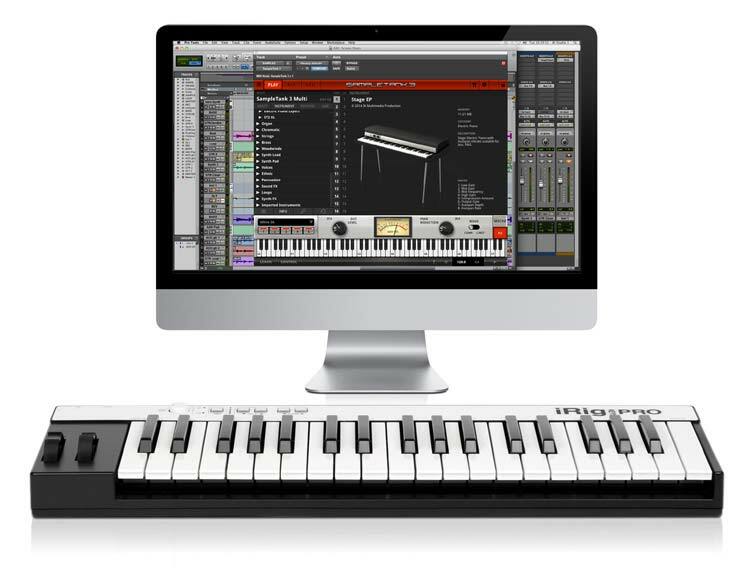 Available as bundled software with iRig Keys Pro, iRig Keys, iRig Keys Mini, iRig Keys 37 Pro, iRig Keys 37, iRig Keys 25, iRig MIDI 2, iRig Pads, iRig Pro, iRig Pro I/O and iRig Pro Duo or as an individual purchase, it gives you the freedom to experiment with the fully functional software and a 6.5 GB library of high quality instruments, loops and MIDI patterns that illustrate the broad sonic versatility available in the full version of SampleTank 3. SampleTank 3 SE also supports user sample importing and the use of Powered-by-SampleTank legacy libraries. SampleTank 3 SE gives you a taste of the 4,000 instruments available in the full version via 400 carefully selected, meticulously sampled instruments from 20 categories that stretch across every genre, style and type imaginable. With it, you get pianos, drums, basses, guitars, synthesizers, brass, strings, vocals and other more exotic sounds that all shine brightly and stand out in any mix with little-to-no adjustment required. In addition to its library of sound, you can also choose from a growing selection of exciting and inspiring SampleTank instruments collections, available on the online store and in the Custom Shop. With new additions every month, these instruments are custom tailored to give you the tools you need to create any style of music from acoustic to electronic and beyond. Beyond its sounds, you also get access to its new built-in MIDI engine that you can use with its collection of 250 loops and 150 MIDI patterns recorded by some of the finest drummers and percussionists in the world. The reason SampleTank has remained an industry standard after all these years is due to its superior sound quality, extensive variety and ease of use. With its easy-to-use interface, all the sounds you need are just a click away. SampleTank 3 SE gives you a taste of the breadth of the full version with 400 instruments that stretch across nearly every possible category. And just like in the full version,you can take advantage of SampleTank 3’s multiple articulations and new “round-robin” feature to inject a lifelike expressiveness to your playing with many of the available sounds. All this means that SampleTank 3 SE’s pianos, drums, basses, guitars, synthesizers, brass, strings, vocals and other more exotic sounds shine brightly and stand out in any mix with little-to-no adjustment required. You can expand SampleTank 3's library via additional material available on the IK Online Store. This additional content lets you customize your SampleTank 3 experience so that you can access even more creative frontiers in its universe of sounds.